WWW.RLFANS.COM • View topic - Wigan 19 to face St Helens Friday. Adrian Lam names 19-man squad to face St Helens on Good Friday. O’Loughlin, Flower and Greenwood return for Wigan. Old rivals face off at the DW Stadium at 3pm in the Betfred Super League. Wigan Warriors Head Coach, Adrian Lam, has named his 19-man squad to face rivals St Helens on Good Friday at the DW Stadium, 3pm kick-off. Last time the two Clubs met, St Helens came out on top at the Totally Wicked Stadium back in January. 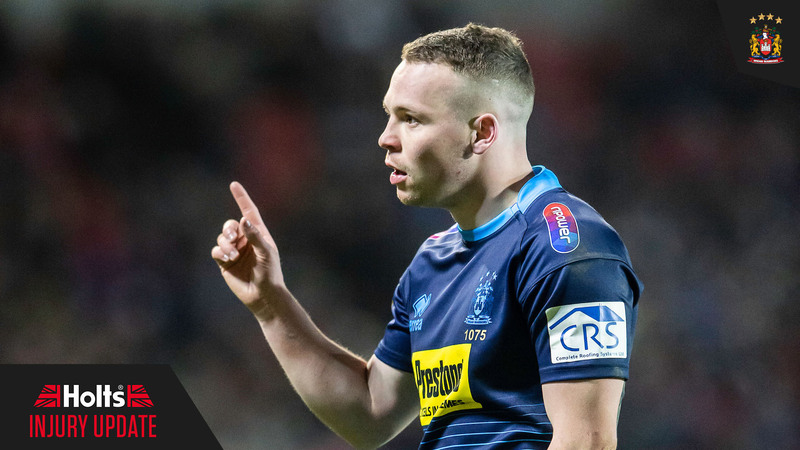 Adrian Lam’s side will want to make amends in front of a packed DW Stadium this Good Friday as the two meet in the biggest derby in the Betfred Super League. A number of positives for Wigan this week as captain Sean O’Loughlin, Ben Flower and Joe Greenwood are all made available after missing out last week. Long-term absentees Tony Clubb, Liam Marshall, Dom Manfredi and Liam Farrell remain on the comeback trail. Sam Powell will serve the first of his two-match ban received this week following an incident vs Wakefield Trinity last Friday. Joe Bullock, Joe Burgess, Tom Davies, Morgan Escare, Ben Flower, Oliver Gildart, Joe Greenwood, Chris Hankinson, Zak Hardaker, Willie Isa, Tommy Leuluai, Romain Navarrete, Sean O’Loughlin, Oliver Partington, Dan Sarginson, Jake Shorrocks, Morgan Smithies, Taulima Tautai, George Williams. 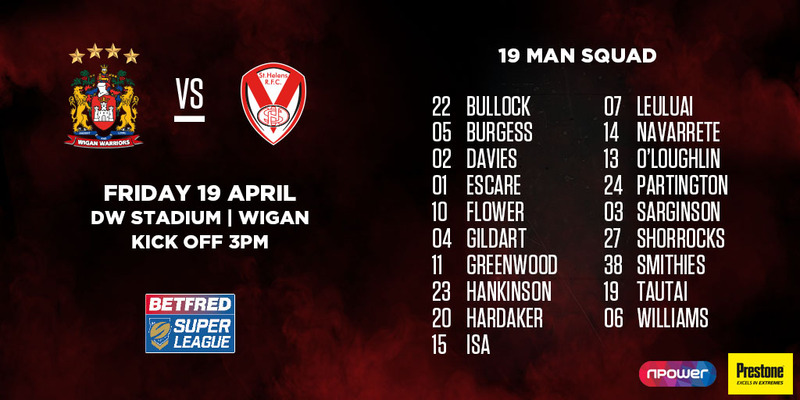 Re: Wigan 19 to face St Helens Friday. Looks like the strongest squad we can put out at the moment. Hankinson back in, possibly cover for second row if Greenwood gets pulled out ? Lockers to share hooking with TL perhaps? jinkin jimmy wrote: Lockers to share hooking with TL perhaps? Or Williams with Lockers moving to #6 for a spell? apollosghost wrote: Looks like the strongest squad we can put out at the moment. Last time we saw Hankinson it looked like he was already being bulked up for second row. Rogues Gallery wrote: Or Williams with Lockers moving to #6 for a spell? Escare to come on at 6, Williams to 9 for a spell? Starting props is a conundrum, got to assume Saints will start with Walmesley and Thompson so do we go with Flower and Bullock and try to hold them or do we leave one on the bench to give us a bit of oomph for the interchange ? Return of Greenwood makes a huge difference to our attack. With Flower and SoL back too it gives us an outside chance rather than no hope. apollosghost wrote: Starting props is a conundrum, got to assume Saints will start with Walmesley and Thompson so do we go with Flower and Bullock and try to hold them or do we leave one on the bench to give us a bit of oomph for the interchange ? I’d be tempted to start with Flower and TT with Bullock and Navarette off the bench. We need TT and Navarette to bring it and not give their usual drivel. I’m actually quite encouraged with that squad. A marker for the season could be laid on Friday.